So it’s pretty easy to tell when I have been at work all day. Can you guess the telltale sign in this picture? It’s not the disheveled tie, I wore it like that all day because I like the look of an askew tie. I think I am more fond of that look than L, because she asked that I straighten it for these pictures. If you have a trained eye, you can notice the bags under the eyes and the dry skin that comes from spending all day in an office under headache-inducing florescent lighting, but again that is too obvious. It also has nothing to do with the grey kitten running away from me, but that’s another good guess. No, for me, a more telling sign is the lumpy, crumpled sweater. This Burberry sweater is one of my favorites, has been for years, and when I wear it I try to keep it as neat and properly adjusted as possible. But sometime after hour 8 at work, I just stopped caring and that’s what the top shot recorded. 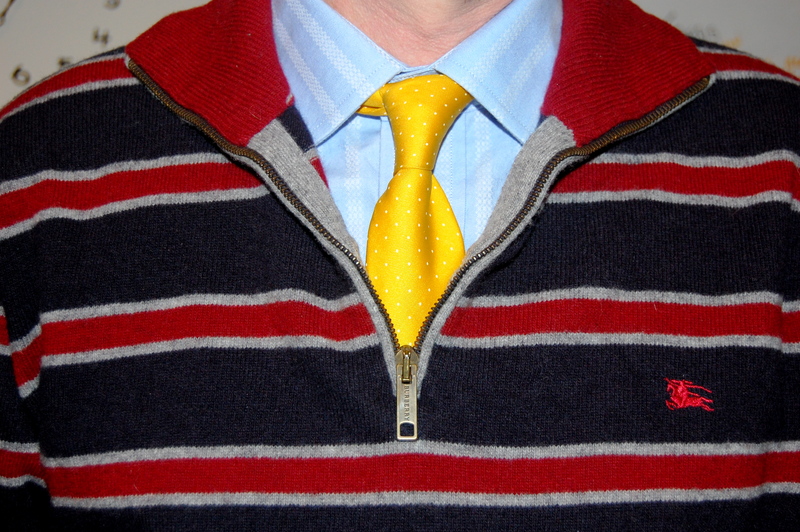 When properly adjusted with the re-tied, vintage Cardinale tie, it looks like this. This entry was posted in His, Outfits and tagged burberry, cardinale, costume national, postaday2011, theory, tommy hilfiger, victorinox, vintage. Bookmark the permalink.